E. Charlton Fortune was never one to be bound by limitations. Whether in her travels, her art, or her life, Fortune refused to be confined by obstacles that would have inhibited most. Women in the late 19th and early 20th centuries faced outmoded expectations, but Fortune was unmoved by such constructs. Instead of softening, she painted ever more rugged and virile compositions. Fortune’s refusal to follow prevailing trends in painting, such as the more socially conscious works by Diego Rivera, reveal her stubborn adherence to her own passions and principles: painting overtly beautiful or “happy” paintings amidst the popular, yet less aesthetically pleasing art of the day, despite critics’ disapproval. There’s a distinctive singularity evident in her life and work that transcends the status quo and reflects Fortune’s spirited resolve. E. Charlton Fortune, Triptych after Puvis de Chavannes’ La vie pastorale de sainte Geneviève, 1912. Gouache on cardboard, 9 3/4 x 20 1/4 inches. Saint Mary’s College Museum of Art. Gift of Clemence M. Otto. Fortune brought her own vision and voice to her work, forging her own path in her own way, and the Crocker is proud to feature 85 works by this bike-riding, plein-air painting, spirited pioneer. Get inspired to follow your passion and check out E. Charlton Fortune: The Colorful Spirit on view at the Crocker beginning January 28. Theater at the Crocker: "Fortune’s Way, or Notes on Art for Catholics (and Others)"
To open the exhibition, the Crocker and Capital Stage bring art to life through a theatrical reading. Written by Steve Hauk, Fortune’s Way is a dynamic two-person play that offers audiences the chance to “meet” E. Charlton Fortune through the auspices of an art history lecture. Along the way, we get to know Effie (as she is known by friends) – her struggles, her joys, and the fortitude of spirit she needed to find success as a female in a man's era. This presentation of Fortune's Way is generously sponsored by the Kingsley Art Club. Register here. Enjoy new and vintage games, coloring, pub trivia, sing-alongs, and a cash bar. In the gallery of the exhibition, take inspiration from this artist who made a singular life for herself against the odds, and share your own voice through poetry. Sign-ups for poetry begin at 6 PM, and the open mic will start at 7 PM. Register here. This spring, the Crocker will host three exhibitions, each devoted to an important American female artist: E. Charlton Fortune, Corita Kent, and Faith Ringgold. Because the dates of these shows overlap, they offer a unique opportunity to explore in depth the subject of women in 20th-century art history. From Fortune’s picturesque Impressionism to Kent’s spiritually-infused Pop and Ringgold’s socially-engaged quilts, explore the unique contributions these women and their sister artists have made to the history of American art. Three Sundays, February 25 – March 11, 1 – 3 PM. Instructor: Kevin Muller. Register here. Artist Euphemia Charlton Fortune found her way to success in the decidedly male-dominated art world of the early-20th century. In the largest exhibition of Fortune’s work ever presented, viewers will receive a full and robust understanding of her extraordinary career and Impressionist depictions. Join Scott A. Shields, the Crocker’s chief curator and associate director, for an in-depth look at Fortune, her work, and her colorful spirit. Register here. Join an in-depth examination of Fortune’s, Summer Morning, St. Ives (St. Ives Harbor), 1923. Before or after the 30-minute gallery conversation, take time to enjoy lunch at the Crocker Cafe by Supper Club. Each Lunch & Learn features a different work of art . Learn about E. Charlton Fortune, the trailblazing female artist whose work will be on view in a grand exhibition this spring. Try your hand at Fortune’s Impressionist style with a visit to the studio. Register here. 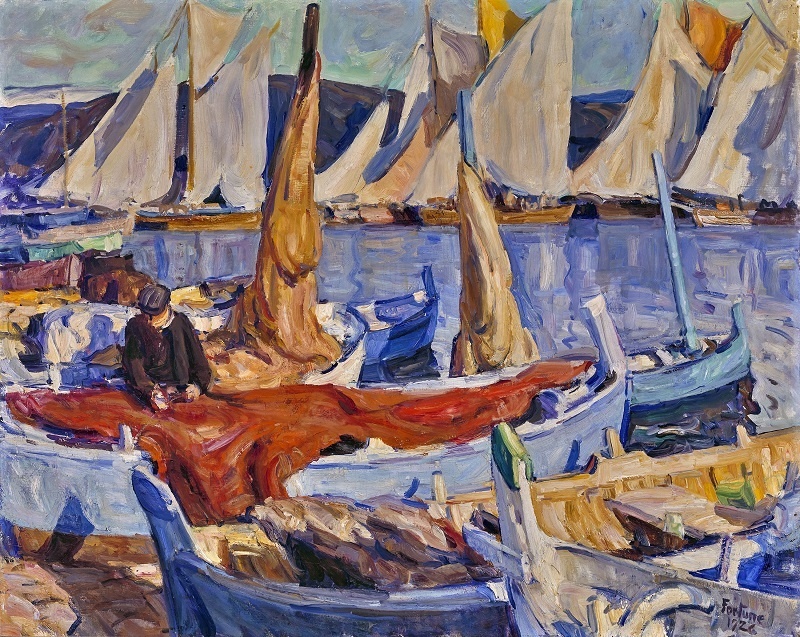 Cover photo: E. Charlton Fortune, Drying Sails, St. Tropez, 1926. Oil on canvas on Masonite, 38 1/8 x 48 1/4 inches. Monterey Museum of Art. Robert J. Dwyer Trust.